Starring John Wayne, Ray Corrigan, Max Terhune, Louise Brooks. Ask the old folks, they know -- kids of the 1930s were crazy about a series western branded line called "The Three Mesquiteers", who could always be depended on for plenty of ridin', ropin' and shootin'. Moppets in the States would swarm to Saturday matinees, where a Three Mesquiteers installment might be the main attraction on a slate of cartoons and short subjects. In small towns in England, one critic tells us, theater managers installed rows of hobby horses in the front of his auditorium so that the small fry could ride and shoot (if they brought their toy guns) right along with the characters on screen. Republic was the champeen producer of series westerns, which held their own very profitable niche in the industry. Some of the big studios tried their hand in the genre as well. Robert S. Birchard once showed me photos of movie cowboys hanging out at "Gower Gulch" in full costume, looking to see who was hiring -- right up until the war years. 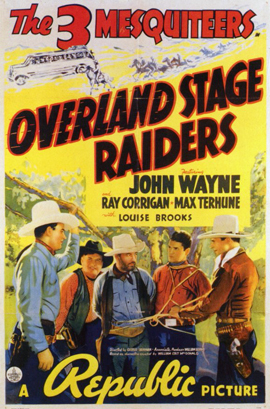 Olive Films is taking a flyer with four Mesquiteers pictures, all streeting on October 2: Red River Range, The Night Riders, Three Texas Steers and the one reviewed in brief here, Overland Stage Raiders. In film school we were told that John Ford rescued John Wayne's career by hiring him for Stagecoach. Wayne had been in pictures from the late '20s on and had a notable lead role in Raoul Walsh's ill fated 65mm Grandeur production The Big Trail. From then on he was always busy but never in large parts unless working in the western ghetto. Olive Films' production notes tell us the reality of series westerns, which sounds as pitiful as the satire in the 1975 comedy Hearts of the West. 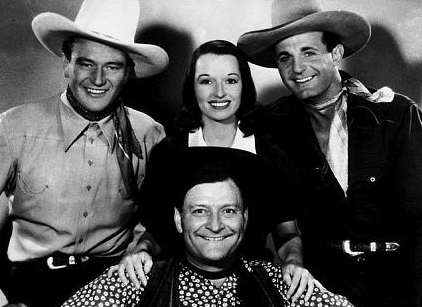 When Wayne took the lead part of Stony Brooke in the Mesquiteers series, he replaced a hard-working fellow named Robert Livingston, who originated the role. Right in the middle of his tenure, Wayne worked in the big-time Ford western. When his contract was up, Republic turned around and re-hired Robert Livingston again! 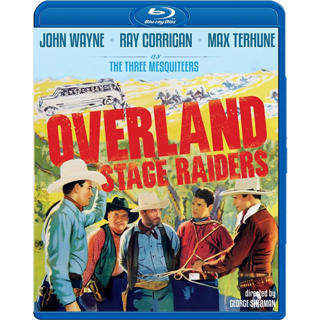 Western fans unfamiliar with the cockeyed world of series westerns must make a few adjustments to Overland Stage Raiders, which takes place in a present-day west with trains and airplanes, but where everybody lives and behaves as if it were 1888. Our heroes ride horses everywhere, rarely at a slower pace than a gallop. The 'raiders' hold up a stagecoach, but also an ordinary 1930s touring bus. The key scene to excite the kiddies must be Stony Brooke cheerfully telling his pals to get ridin', whereupon they all leap on their steeds and peel out as if doing the quarter finals at a drag strip. The 'let's ride!' action is synonymous with 'surf's up!' in a beach movie. The story sees a stagecoach from an important mine robbed by some pitifully incompetent thieves -- at the first sign of trouble they abandon their loot and ride away. Stoney (Wayne) and his pals Tucson Smith (Ray "Crash" Corrigan) and Lullaby Joslin (Max Terhune) see the cure for this highway robbery in investing in the air service of Ned and Beth Hoyt (Anthony Marsh & Louise Brooks), a brother and sister. What they don't know is that a low-down polecat (a competing businessman) will hire all the varmint outlaws he needs to sabotage the delivery. He even hires an employee of the company, disgruntled because he hasn't been considered for pilot duty. 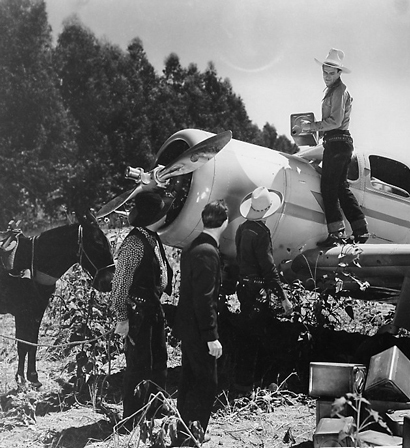 Two out-of-town thugs eventually hijack the Hoyts' plane, which crashes in a secret spot. The Three Mesquiteers trick the location out of the turncoat employee, and save the day. Before moving on to more description of the film, it's important to note that the Louise Brooks mentioned above is THE Louise Brooks, of Pandora's Box. Brooks was one of the most famous and fascinating figures of the 1920s, a true flapper libertine who established styles, turned the heads of millionaires and rode a wave of popularity until tossing it all away in self-destructive rebellion. Just eight years after walking out on her Paramount contract she was a functional unknown in need of a job. In her own writing Ms. Brooks dismissed Overland Stage Raiders with a sentence or two, and she was right to do so. It's a nothing role not given so much as a close-up. Brooks wears an unflattering hairstyle and plays in the same amateurish vein as everyone else. She left her best performances in France and Germany just before full talking sound came in. The plot of this 55-minute wonder finds a reason for a fast ride or a chase about 1.5 times per reel, and the last ten minutes are solid action. A lot of people get shot, some of them dead, but nobody slows down for first aid or burials -- they just disappear unmourned. We also enjoy a number of impressive horse stunts, the one most repeated being a trick where one of the good Mesquiteers leaps from his horse at full gallop, pulls a bad guy out of the saddle, and tumbles into the dust with him. The biggest question is, why is transporting gold or payrolls so difficult in these here parts, when the area is already serviced by the railroad? We understand immediately why western fans loved John Wayne. He's big, honest and sincere, and projects a winning personality. He also takes the story completely seriously, showing no sign of I'm-too-important-for-this. Producers must have loved The Duke in that nobody who hired him ever got cheated out his best performance. I'm not too familiar with Max Terhune (1) but Ray Corrigan is immediately recognizable, or, at least his chin is. He has a pleasant personality as well, but I'm afraid we Science Fiction fans know him best from his role as the Venusian monster in It! The Terror from Beyond Space. in that movie they shoehorned Ray into a costume meant for a smaller person (Paul Blaisdell, the costume-maker). The monster mask he was meant to wear didn't fit. The solution was to stick Corrigan's distinctive chin through the mouth opening, paint it black, and call it a tongue. The monster tongue is a perfect match for Corrigan's chin. Case closed. What comes as a bigger surprise in these Republic series westerns is that the production values are quite good. The direction is basic, often with a locked-down camera on dialogue scenes, but the action is very well filmed and the sound recording, mixing, etc. completely up to par for 1938. These oaters were made with pride, no doubt about that. Olive Films' Blu-ray of Overland Stage Raiders looks absolutely perfect, as if its negative were finished yesterday. All of these Mesquiteers movies have been abused through years of VHS and DVD releases of terrible prints with crummy sound, but Olive's transfers look newer than new. Since no composer credit is given I assume the music is all library material re-used from film to film. Old folks will consider this a treasure and adventurous young viewers might want to give it a try. One first must get past the idea of a cowboy world coexisting with jeeps and airplanes. It's kind of like movies in which dinosaurs coexist with cavemen. Max Terhune was a veteran vaudevillian with a wide range of skills. In the later Range Busters" series, starring Corrigan and filmed on Corrigan's ranch, Terhune always appeared with his ventriloquist dummy "Elmer". You think planes appearing in the old west is weird, wait till you see Elmer. These films also let him show off his skills as magician, whistling champ and animal imitator. Yup, animal imitator. And a word about Corrigan: Although you mention his appearance in It! Terror from Beyond Space, you fail to mention his other notable sci-fi role as the star of the Republic serial Undersea Kingdom. Although they're almost two generations before my time, I'm a huge fan of the series Western. And I've always felt they've never received the critical study they deserve. For example, their portrayal of women is far ahead of their "A" counterparts. Probably largely due to the fact that many of these films were written by women. Further, I also believe the series Western is the beating heart of the Western genre. And their demise is probably the greatest contributing factor to the ultimate death of Western. They indoctrinated children into the genre, thus, making them more open to the adult westerns when they were old enough.